Republican politician, Orrin Hatch, an attorney by profession, is the longest-serving Republican Senator in the United States’s history. He has been representing the state of Utah as her senior Senator since 1977. The Senate seat was his first run for office and since dethroning 3-year incumbent Democrat, Frank Moss, Hatch has never faced any major opposition and has been re-elected over 5 times – an incredible track record that has attracted fellow Mormons to the Republican party. A strong crusader for conservative values (many of which he has sponsored into law), Orrin Hatch is perhaps one of the most unbiased conservatives in American politics, having teamed up with Democrats to support bills he believes in. Hatch was a vocal supporter of Donald Trump during his 2016 race to the nation’s highest office. In early 2018, the longtime Senator announced his retirement at the end of his 7th term. Orrin Grant Hatch was born on March 22, 1934, in Pittsburgh, Pennsylvania where he was also raised. Hatch was born to Helen Frances and Jesse Hatch. His father Jesse’s job as a metal lather barely produced enough to cater for Orrin and his 8 siblings. Unfortunately, two of his siblings passed while in their infancy. Determined to escape the impoverished conditions he was raised in, Orrin would become the first member of his family to earn a college degree. Despite his diligence towards his academics, Hatch didn’t ignore other aspects of life. As a young boy, he picked up an interest in boxing and fought at the amateur level in 11 bouts. Hatch also developed a passion for music and steadily developed his musical side while pursuing his legal career. Shortly after earning his J.D in 1962, Orinn Hatch began practicing law in Pittsburgh. Seven years later, he relocated to Salt Lake City, Utah to continue his legal practice. 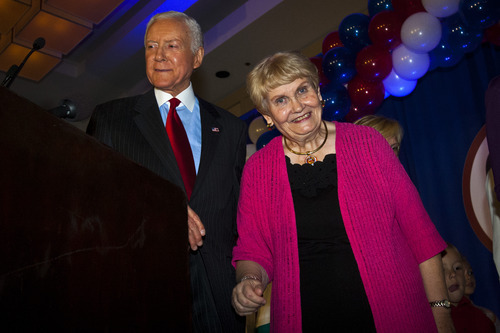 After 5 years living and raising his family in Utah, Orrin Hatch began his political career. In the 1976 elections, he ran for his first public office, the Senate seat in Utah and won, dethroning three-year Democratic incumbent, Frank Moss. Over a decade later, Hatch would come to defeat Moss’ son Brian Moss during his bid for re-election in 1988. Hatch entered the 2000 race to the White House but dropped out after failing to clinch the Republican nomination which went to then-Texas Governor George W. Bush who won the general polls. Over the years, Orrin Hatch has become a leading voice among conservatives. No other legislator has sponsored more bills into law than Orrin Hatch. He has served on many committees during his time in the Senate including; committee on Finance, Judiciary, Taxation as well as the committee on Health, Education, Labor, and Pensions. Orrin Hatch became the President pro tempore of the Senate in January 2015. Hatch graduated from Baldwin High School in Pittsburgh. He earned a B.A in History from Brigham Young University in 1959 and earned his Juris Doctor degree from the University of Pittsburgh School of Law in 1962. During his time attending law school, Hatch is said to have lived in a refurbished chicken coop behind his parent’s house. Orrin Hatch bolsters his earnings as a senator with diversified investments. The senator has made lucrative investments in varying sectors including real estate, finance, energy, and insurance. Hatch’s works in music earned him tens of thousands of dollars. His records with the LDS is said to have earned him over $10,000. The senator’s net worth has been estimated at about $5 million. Senator Orrin Hatch is married to Elaine Hansen. They tied the knot on the 28th of August 1957 and have remained married ever since with no scandal whatsoever. The long-time couple celebrated their 60th wedding anniversary in 2017. Hatch took to social media to post a photo of himself and his Eliane, carrying a balloon that read “60”. The photo was accompanied by a caption where Hatch gushed about the love of his life, describing her as a wonderful companion. Hatch and his spouse have 6 children together. They include three sons – Scott, Brent, Jesse, as well as three daughters; Marcia, Alysa, and Kimberly. One of Orrin’s sons Scott works as a lobbyist with Washington lobbyist firm, Walker, Martin & Hatch LLC. Hatch and his wife are proud grandparents to 23 grandchildren and 14 great-grandchildren.